This is all that is left of Emily’s truffle pasta from Friday night, it was incredible. In a large heavy bottomed sauce pan sauté shallots and garlic for one minute in olive over medium heat. 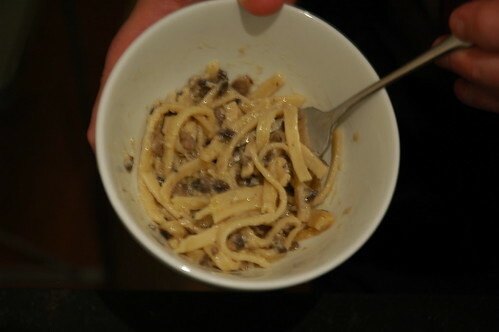 Add mushrooms and truffles (optional) and cook until most of the liquid from the mushrooms had evaporated. Add chicken stock, wine, and thyme sprigs and simmer until reduced by half. Remove thyme sprigs. Turn heat to low and add cream. Remove ½ cup liquid from the pot and place in a bowl. Whisk in flour to the bowl. Return flour mixture to the pot and slowly bring the sauce to a boil stirring constantly. If sauce needs further thickening remove another ½ sauce and add one extra tablespoon of four. Pour in truffle oil and continue to stir. Season with salt and pepper to taste. When sauce has come to a boil and reached your preferred thickness remove from heat and toss with al dente linguini. Serve and top each individual bowl with fresh shaved Parmesan.